An exciting and thoughtful movie about resistance and collaboration in Occupied Paris: based on an actual Resistance group and its formation, actions and betrayal. Army of Crime is essential viewing for anyone interested in France under Nazi Occupation and the controversial issues of Resistance and Collaboration. At its most basic level, as a war movie, Guediguian's movie is exciting, with impressively mounted scenes of violent action.It generates considerable tension. Army of Crime avoids false heroics and sentimentality. It also successfully integrates a few romantic scenes, as well as careful observation of the process of setting up a resistance cell and planning attacks along with dynamic set-pieces. On another level Army of Crime also succeeds in the uniqueness of its subject-matter. It is the only movie in the Resistance / Occupation genre that focuses on the role of resistance fighters whose members were drawn from foreign refugees who had sought freedom in pre-war France from persecution for their anti-fascist views: Poles, Spaniards, Armenians, Hungarians, even Italians. Some were immigrant workers. Many of them were Jews and/or Communists. Some had married French citizens. 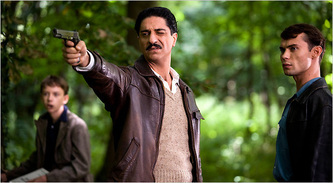 Of the members of resistance cell that is the focus of the movie, the 'Manouchian group' (named after its leader) Missak Manouchian, seven were from Poland, five from Italy, two came from Romania, Manouchian and one other came fro Armenia, and one came from Hungary, Spain and France. Eleven were Jews. The cell was known as the FTP-MOI - Francs Tireurs et Partisans - Main d-oeuvre Immigree. The movie shows that the 'French' Resistance movement included groups whom were not of French origin, or, in the case of French Jews, not regarded by the Germans and many French citizens as truly French. The notorious "Red Poster" (Affiche Rouge) issued by the Occupation authorities after the execution of members of the Manouchian Group. Mug shot of Manouchian taken before his execution. Letter written by Manouchian to his wife a few hours before his execution. The English translation is on the right. In a few hours I will no longer be of this world. We are going to be shot this afternoon at 3.00pm. This is happening to me as an accident in my life, I do not believe it and yet I know that I will never see you again. With the help of friends who will be willing to honour me properly, you will publish my poems and writings that are worth being read. If possible you will bring my souvenirs to my parents in Armenia. I will soon die with my 23 comrades with the courage and the serenity of a man with a very clear conscience, for personally, I haven’t done any harm to anybody and if I have, I did it without hatred. Today is sunny. It is while looking at the sun and the beautiful nature that I loved so much that I will say farewell to life and to all of you, my beloved wife and my beloved friends. I forgive all those who did hurt me or those who wanted to do so, with the exception of the one who betrayed us to save his life and those who denounced us. Lots of love to you and to your sister and all the friends who know me, near and far, I hold you all in my heart. Farewell. Your friend, your comrade, your husband. P.S. I have fifteen thousand francs in the suitcase of the ‘rue de Plaisance’. If you can take them, pay off my debts and give the rest to Armène. M.M." Not only does Army of Crime dare to examine the morality of violence used against a violent ideology. It also reveals the all too human weaknesses of the Manouchian group: suspicion, carelessness, weariness, the demands of love. 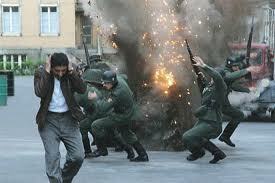 But the movie shows that the Resistance cell's downfall is more than the result of human frailties. Most importantly, the greatest danger comes from the indifference and betrayal by French men and women who are willingly to collaborate with the German authorities. The movie repeatedly shows French police, detectives and civilians actively assisting the Germans - from passively observing deportation of French Jews to tracking down Resistance members, interrogating and brutally torturing them to assist the Gestapo. Army of Crime makes it clear that the German Occupation relied on the willing assistance of the French public at large. On the other hand, the movie also suggests how collaborationist / German overreach could be turned against the Occupying regime. 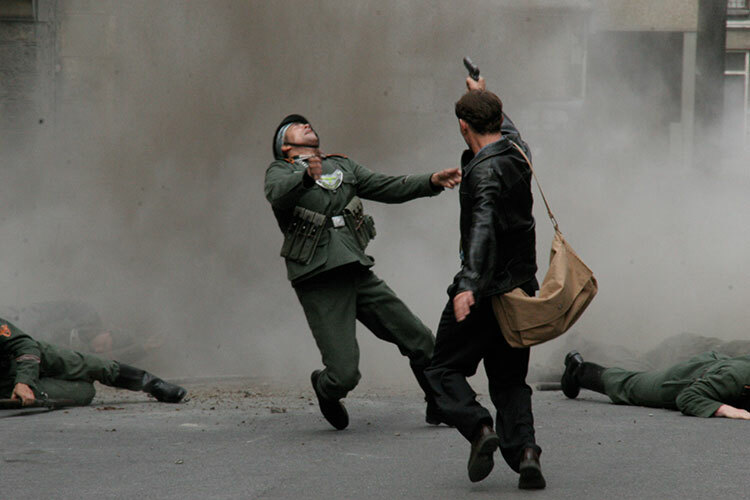 Although this demolition of the Gaullist myth of a France supportive of the Resistance and united against the Nazi tyranny had most famously been the subject of the great Melville movie Army of Shadows, Guediguian's film made its points more explicitly. The now infamous but once rather respectable (in the eyes of some) Milice Francaise had, for a time, considerable popular and institutional support. Perhaps these factors account for the rather muted reception it received in France, Overseas reactions were much more positive.The legend of the Resistance and the Occupation , and the French responses to each remains a contentious issue seven decades on. The coolly effective, suave and ruthless Parisian police chief leading the fight against Paris Resistance members. One of the Paris training schools for members of the Milice Francaise. 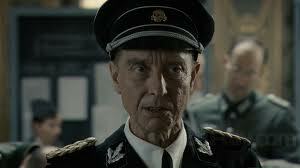 The movie emphasises the role of French officials in seeking, arresting and torturing Resistance members. Fake Milice ID card used by a Resistance member. Poster for the Milice Francaise, the French unit tasked with the job of hunting down Resistance units. Note the slogan and image: both focus on the anti-communist aspect. Notice announcing execution of Resistance members. 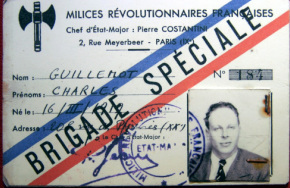 The Resistance cell led by Manouchian -the FTP-MOI - was a group that was nominally under the control of the French Communist Resistance, whose motives, tactics and membership were frequently at odds with those of the Resistance movement loyal to Charles de Gaulle. In June, 1941, the various separate communist resistance cells formed a common organisation. It wasn't until the Nazi invasion of Russia that the Communist resistance abandoned its previous awkward official stance that Nazi Germany and Soviet Russia were not enemies but bound together by the Nazi-Soviet Pact. However Operation Barbarossa meant that French Communists played a much more enthusiastic and effective role in resistance, distinguished by their effective and aggressive tactics, with an emphasis on para-military activities rather than espionage and sabotage. (In late 1942 the Communist resistance and the de Gaulle resistance joined forces in the Comite Francais de Liberation National, although the partnership was full of tension and the two groups remained in fractious contention.) The Allies and de Gaulle regarded the tactics of groups like the FTP-MOI as endangering civilians and alienating French public opinion: the Germans retaliated with reprisal shootings of members of the public. Army of Crime is accurate in the way in which it reveals the politics of the FTP-MOI. There was a tension between those members sometimes carried away by a growing love of violence and those who urged caution. Some of the group were unhappy with the Communist leadership's occasionally cavalier attitude towards the dangers faced by members and bytheir placing political objectives, especially those of their Russian masters, first and foremost.